Why so few homages to Brahms? He exerted a huge influence on many composers in the half century following his death, but few, if any, chose to acknowledge that debt through dedications or Brahms-themed works. In more recent times, Ligeti was commissioned to write a piece commemorating Brahms. His response was that he didn’t like Brahms very much, but in order to fulfil the terms of the commission he would write a work that used the same instrumentation as one by Brahms, his Horn Trio. The situation is particularly puzzling when compared with Mahler, for whom no end of 20th and 21st century homages have been composed. The answer lies, perhaps, in the nature of the two composers’ musical discourse. Mahler’s music is always open to a variety of interpretations. His symphonies draw in styles and ideas and invite the listener to make their own connections and draw their own conclusions. Brahms, by contrast, usually insists on having the last word. When we appreciate a Brahms symphony, we reach a state of agreement with the composer about the musical conclusions he himself has already drawn. There isn’t much more to say. So when Wolfgang Rihm was commissioned by Numa Bischof Ullmann, Director of the Lucerne Symphony Orchestra, to write orchestral responses to each of Brahms’ four symphonies, the task must have seemed daunting. Fortunately, Rihm is the sort of composer for whom inspiration flows without too much difficulty, and, if his comments in the liner note are anything to go by, he was soon able to fashion responses to each of these stubbornly non-dialogic works. And although he argues to the contrary, the process of breaking Brahms’ insularity, rather than the earlier composer’s developmental method, seems to have become the subject of each of these four symphonic “pendants”. The title “Nähe fern” (distant proximity) suggests as much. Brahms remains at arms-reach throughout this cycle. Short motifs and melodic passages appear, but always out of context, or rather in a new context that Rihm seems to have deliberately styled to oppose the harmonic fabric and developmental logic of Brahms’ scores. The passage of history is acknowledged: the more granular passages often sound like Webern, and the more grandiose ones the post-tonal symphonism of Robert Simpson (though I doubt that is a deliberate reference). Rihm is no stranger to homage projects (he has since written A Tribute, which he describes as a ‘homage to English music’ – intriguing!) and this sort of work brings out his gentler side. So the harmonies are open and warm, not tonal as such, but not aggressively dissonant either. There is an air of Impressionism about the way that the music moves from texture to texture, only very rarely punctuated by hard accents or cadential closure. And across the top of these flowing textures appear tiny snippets from Brahms’ symphonies, often over stacked fourth or seventh chords, or against repeating-note accompaniments that oppose their tonality. As individual works, each of these movements was no doubt very successful, especially as each premiered in concerts where they were coupled with the relevant Brahms symphony. 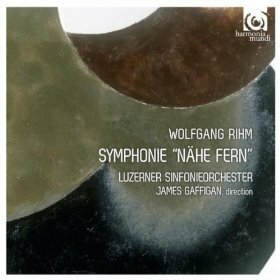 But Rihm has brought the four works together, added a Goethe setting for baritone and orchestra as the second number, and now calls the result a symphony in its own right. That move has certainly facilitated commercial recording, and may even find these movements further performances, but artistically it is problematic. The individual “pendants” don’t function as symphonic movements, and the relationships between them, both musical and dramatic, are too limited in scope for the overall work to add up to more than a sum of its parts. Rihm might tell us that this is a symphony, but it is really more of a commentary on the idea – a metasymphony perhaps. Leaving that problem aside, this is a very fine recording and is well worth hearing, especially for followers of Rihm’s recent music. The forces that first performed this music, conductor James Gaffigan and the Lucerne Symphony Orchestra, are sympathetic and skilled interpreters. The problem for them is working out whether to play this music like Brahms or like Rihm, but they find an ideal balance that clearly favours the latter. Good sound, good liner notes and elegant packaging seal the deal. Wolfgang Rihm remains, as ever, on adventurous form, so it is great that Harmonia Mundi continues to have faith in his wayward and unpredictable genius, presenting commercial recordings of his recent music with production values that most contemporary composers can only dream of.